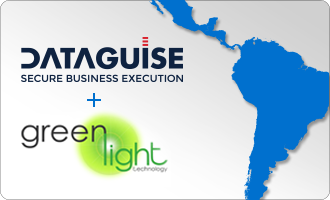 FREMONT, Calif. — April 28, 2016 —Dataguise, a technology leader in secure business execution, today announced a partnership with master IT distributor Green Light Technology (GLT), extending availability of Dataguise DgSecure® to enterprises throughout Latin America. The Dataguise partnership with GLT brings a unique depth of technical expertise to organizations with challenges in information security and compliance. Availability of Dataguise DgSecure complements GLT’s solution portfolio to safely unlock the value of big data, databases, and unstructured information for business success. Headquartered in Maitland, Florida, GLT provides custom development, professional services, and the recommendation, implementation and customization of best-of-breed software products to organizations throughout Latin America. The solution provider builds solutions that create a bridge between legacy and advanced technologies to meet the needs of companies in a range of industries. GLT works with a number of organizations to leverage business analytics powered by Hadoop and other big data platforms. Dataguise now supports these efforts by GLT with cradle to grave protection of the data to ensure that sensitive information is detected upon creation, protected from unauthorized access, and monitored in real-time to prevent threats from impacting business operations. The flagship offering by Dataguise is DgSecure, a highly automated data-centric security platform that precisely monitors access and activities associated with sensitive data such as email addresses, Social Security numbers, credit card numbers, or other confidential or personally identifiable information (PII). The solution works seamlessly with all leading big data and database platform vendors. DgSecure is also ideal for protecting vast pools of difficult to aggregate unstructured data for end-to-end protection of sensitive data.